In February 2015, Vintage Adventurer Rod Wade took on the Road to Mandalay Rally, a brand new event organised by Endurance Rally Association, the team behind the Peking to Paris. This 24-day journey departed from the iconic Raffles Hotel, Singapore, and travelled through Malaysia, Thailand and created motoring history when crossing the border into Burma to drive the Road to Mandalay. Rod stuck to driving a Ford but this time went for a 1953 Crestline, a rare car that would turn heads. However the rarity also became a challenge as Rod and navigator Jackson Evans struggled to source the parts and spares to prepare the car in time for shipping to Singapore. After importing the Crestline from the USA, Rod immediately contacted the Ford suppliers in America to find what he needed but found it was much harder than anticipated and had to have some parts made from specialists in Australia, America and the UK. In the two weeks leading up to shipping, Rod and Jackson worked tirelessly to get the car ready for its first test drive. There were still some jobs to do but they would have to wait until the team reached Singapore. A garage was booked to sort the fitting of new coil springs. 11 emails were sent from Oz to confirm the garage could do the job but alas no. The guys went off to someone that was recommended but again no!! They decided to call it a day and head back to the hotel and go with the car the way it is. With weak front coil springs, it will be a tricky ’53 to drive but not as difficult as the 1930 Model A.
the Crestline has had the final head retention, tappets reset and a general under bonnet check. On the RTM rally it will be all windows down for sure as well as all vents open. We are looking forward to the day when we can close the engine bay off by fitting the bonnet. What it looks like underneath with skid plates and under body protection. Rod and Jackson arrived at the Raffles Hotel to be met by the greeting master. With the car filled with fuel plus the jerry cans and having been given a thorough clean, she looked her best – apart from not having the new front springs fitted. In the car park, all the competitors were getting to know each other. With 70 entries from 18 different countries, there were happy reunions with those friends made on the Peking to Paris 2013, while some people didn’t need to be introduced, having heard about Rod’s Ocean2Ocean adventures in the classic car press. Final checks were made (and a last ditch attempt to get those flaming springs sorted) and team Vintage Adventurer were ready for the startline and the 10,000kms journey on the Road to Mandalay. Rumour has it a corner was taken a bit quickly, not surprising given the steering, and Rod and Jackson found themselves off the road. There was damage to the car but not the crew thankfully. The car needed a new radiator. Luckily and to the surprise of the Rally’s mechanics, there was one in the boot of the car. Patched up, the car got back on the road but valuable time had been lost. With a patched up car and, yes still those old coil springs, Rod and Jackson continued their journey with the days broken up with time trials and regularity tests. Stops in Trang, Khao Lak, Chumphon and Kanchanaburi followed. The team slowly climbed the leader board until two tanks of rubbish fuel thwarted their progress. One of the most poignant visits on the route was a visit to Hellfire Pass and museum, and the notorious cutting created by the POWs on the Death Railway. There was also the chance to visit the actual ‘bridge over the River Kwai’. Rod said: “What a day! 75k up the black just great. Visited the Hellfire museum then the fun began. It was Mongolia reborn, horrible tracks, car off the ground, head hitting roof, steering wheel 180 degrees out, full lock to the left and only 30 percent to the right, brakes just so so if speed not too fast or down grade too steep. What a handful or is that a basket case full!! “We banged down on the suspension time after time and I was so glad that all the front end was new except for those weak coil springs. The new ones still live in the boot. The carpark at the hotel tonite looked like a wreckers yard. It is now dark and 20:00hrs and some are still at it. “There are engines being flown all around the world trying to catch us up. Some have hired modern cars to go searching for parts and to drive the route whilst their rally cars are trucked ahead to join the car park where the mechanics will weave their magic to keep the driving crews in the game, some working until 1am. Phetchabun, Phrae, and Chiang Mai followed as the competitors edged closer to the Burma border crossing. The scenery was stunning but it was the results of the tests that proved the most exciting for Rod. “The results for today are on the board. The Crestline of Wade and Evans beat the turbo Landcruiser in both the hill climb and the Alpine climb, and Gerry Crown in his P76 in the test (speed trials). 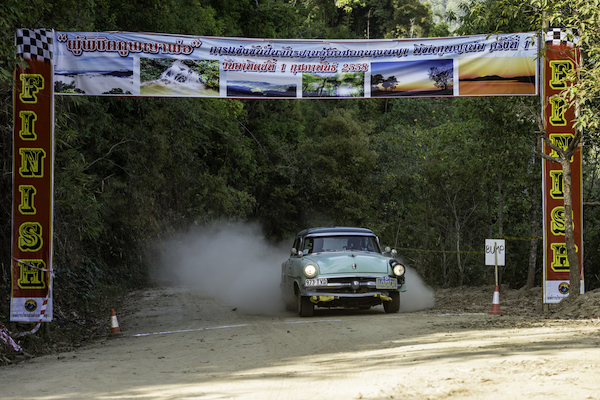 History was made on day 20 when, after three years of planning and negotiations by rally director Philip Young, 70 vintage cars of foreign motoring enthusiasts crossed into Burma in the first land border crossing.